SAN JOSE, Calif.--(BUSINESS WIRE)--Cypress Semiconductor Corp. (Nasdaq: CY), the embedded solutions leader, today announced its Semper™ NOR Flash memory family that delivers the industry’s best combination of safety and reliability for automotive and industrial applications. 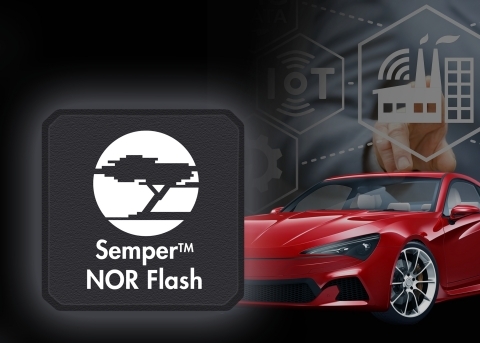 The Semper Flash family is the first memory that is architected and designed to meet the automotive industry’s ISO 26262 functional safety standard for building fail-safe embedded automotive systems. The family is automotive-qualified, ASIL-B functional safety compliant, and provides superior endurance and data retention at the extreme temperatures common in automotive and industrial applications. More information on the Semper Flash family is available at http://www.cypress.com/semper-flash. Cypress’ EnduraFlex™ architecture simplifies system design by enabling a Semper Flash device to be divided into multiple partitions, independently optimized for high endurance or long retention. For frequent data writes, a partition can be configured to deliver up to 1.28 million program-erase cycles for 512Mb density parts and 2.56 million cycles for 1Gb parts. For code and configuration storage, a partition can be configured to retain data for 25 years. Cypress' 512Mb Semper Flash devices are sampling to lead customers now, with qualified samples available in the fourth quarter of 2018. Volume production of the devices with 24-ball BGA, 16-pin SOIC and 8-contact WSON packages is expected in the first quarter of 2019. Cypress and the Cypress logo are registered trademarks and Semper, EnduraFlex and HyperBus are trademarks of Cypress Semiconductor Corp. All other trademarks are property of their owners. 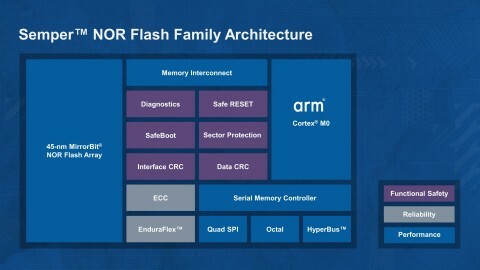 Cypress Semiconductor Corp. announced its Semper NOR Flash memory family that delivers the industry’s best combination of safety and reliability.